Could you become a mentor? Do you have what it takes to become a mentor? One of the best ways to share knowledge and experience across the civil service is to mentor a colleague from another department. Mentoring tends to be long-term, and holistic in nature, looking at an individual as a whole, not only helping them to develop the knowledge to perform their job better but also helping them to consider their key motivators and potential career pathways. In this respect it differs from coaching, which tends to be short-term and more sharply focused around the specific skills required to deliver organisational objectives. By becoming a mentor, you not only can assist someone else but you also open yourself up to new experiences and broaden your own perspectives. It can also help you to reflect on your knowledge, and sharpen up your own active listening and open questioning skills set. 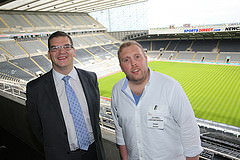 Olly Robbins, Director General of the Civil Service, led the way at Civil Service Live in Newcastle by offering to 'spot-mentor' Stuart Furnell from the Insolvency Service. It was an eye opening experience and extremely beneficial to my personal development. Olly listened to many of my ideas, and offered great advice. It was a fantastic opportunity to be mentored by the Director General of the Civil Service, He seemed very committed to the mentoring process and I am very grateful for the time he spent with me and for the offer of continued advice going forwards. Mentoring is a great low-cost way to help develop yourself and others. If you'd like to get involved and share your knowledge with other civil servants then the first step is to complete your personal mentor profile, and then Civil Service Local will arrange for it to be added to the new database that we are creating with Civil Service Learning.